I don’t think God would mind if the driver of this PT Cruiser borrowed $1.40 from the kitty to replace the right rear taillight bulb. Yeah, not only do I notice vanity plates and the burned out taillight, I also notice the big scrape on the left side of the rear bumper cover. I’ve been in automotive way too long. Anyone who could afford to be God’s ATM could probably afford a little more high style ride than a PT Cruiser. I would imagine if God were to drive a car He would pick something really good like a Mercedes or a BMW, not an underpowered and pathetically forgettable Chrysler offering. 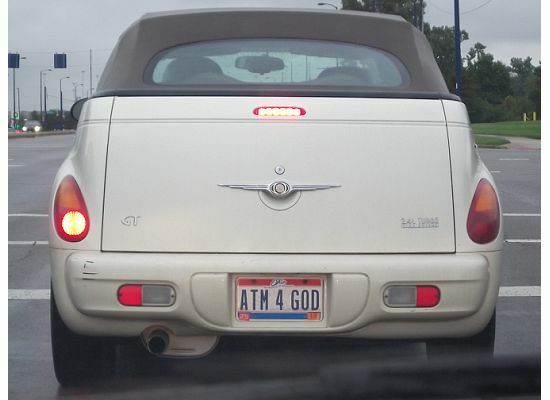 On a philosophical and theological level, the thought of someone being God’s ATM- even as a sort of joke- and especially while driving a PT Cruiser- is a bit unnerving. First of all, I really don’t think God needs money. He created the universe, so it would stand to reason if He needed a few Ben Franklins ($100’s) and Yuppie Food Stamps ($20’s) for some reason that He could handle that without any help from a guy who really needs to check his bulbs and who also needs to stop backing up into poles. Seriously, if God is God, then what in the flying thunder can anyone do for Him? It smacks of arrogance and hubris for anyone to think he or she is indisposable to God. The paradox in this is that humanity was created to serve God but apart from God we can’t even do that. I am reminded of little kids who fashion crafts from things their parents have bought and present the crafts back to the parents as “gifts.” Technically, you’re giving me my own stuff back, only now it’s scribbled and slobbered on. That’s about how good of a job we humans do for God. We take his stuff, make it crappy, and then- if we’re feeling generous- we give it a teeny tiny bit of it back to Him. We put our kids’ lame artwork on the fridge not because it’s good (generally it’s anything BUT fine art) but because we love our kids, and they tried. I’d like to think that God smiles on our lame efforts too, but I really don’t want to fall under the illusion that I’m all that great or important. I know I’m not. I’m certainly not even close to being God’s ATM. Why, oh, why do people whose ancestors come from the British Isles eat some of the most disgusting things? 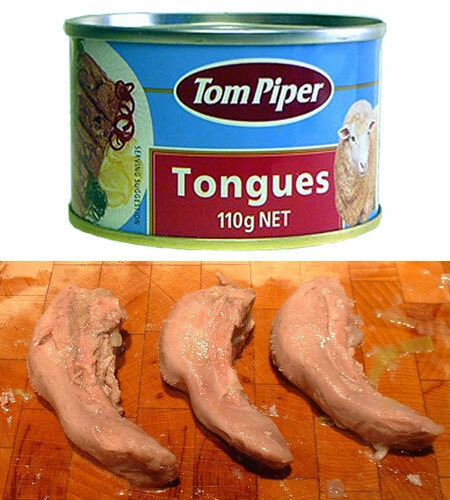 Apparently canned sheep tongues are popular in Australia- complete with the cute little sheepie pictured on the can. I’m surprised they don’t put the cute little sheepie picture on the lamb and rice dog food. 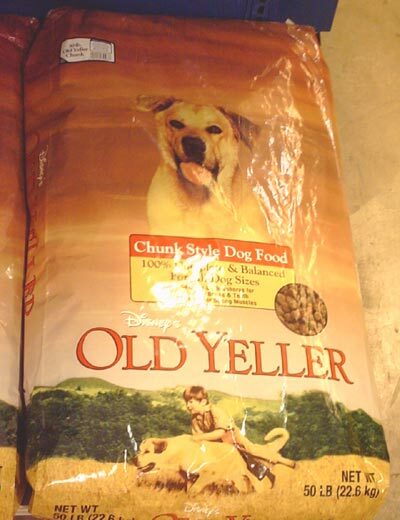 Americans generally aren’t into mutton, so maybe that’s why they picture dogs on the dog food bags. Dogs may be pictured on the bags for the benefit of the illiterate, but I could see how a rube might think that dog food is actually made from dog meat, rather than, “This is what your dog is supposed to eat.” Never underestimate the power and depth of stupidity and/or ignorance. No, Virginia, there is NO dog meat in the dog food bag, regardless of what you see in the picture. I know some people in the US eat beef tongue (nasty enough) but think about it. I’m sure sheep lick each other’s butts just like dogs do, but even if they didn’t, I don’t want to eat something’s tongue. The Brits get the prize for the weirdest food in the Western world by far though. Americans love potato chips, right- but in civilized flavors, such as sour cream and onion, barbeque, cheddar cheese, hot and spicy, etc. 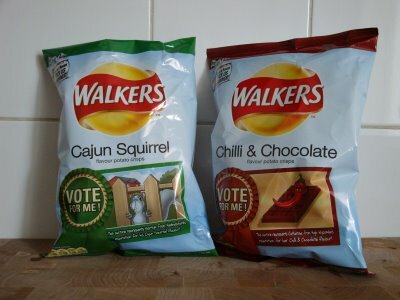 Mmmm, Cajun Squirrel and Chili Chocolate. Remind me if I ever travel to the UK to bring my own stash of food.